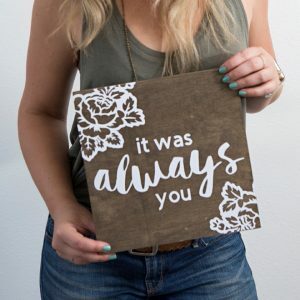 These DIY Wedding Signs Are The Absolute Cutest! You might have heard that we have a brand new SHOP here on Something Turquoise, full of exclusive digital craft files, over 100 designs to be exact… and if you haven’t heard, now you have! 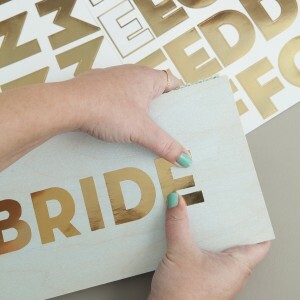 Today we’re sharing 6 new designs that are centered around wedding signs. 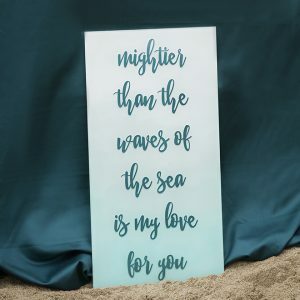 Signs can add darling decor to any wedding and they can also send a special message to your guests, and so we’ve covered a few important sentiments here below. We hope you enjoy these new hand-lettered designs! Our Shop Is Full Of Unique Wedding Craft Files! We’re selling two types of files in our shop, the first are .SVG’s created to use with your Cricut Maker or Cricut Explore. Designs that you can put on t-shirts, hats, tote bags, tumblers, sashes, wood plaques and more! We also have printable files for you; both in black designs and full color. 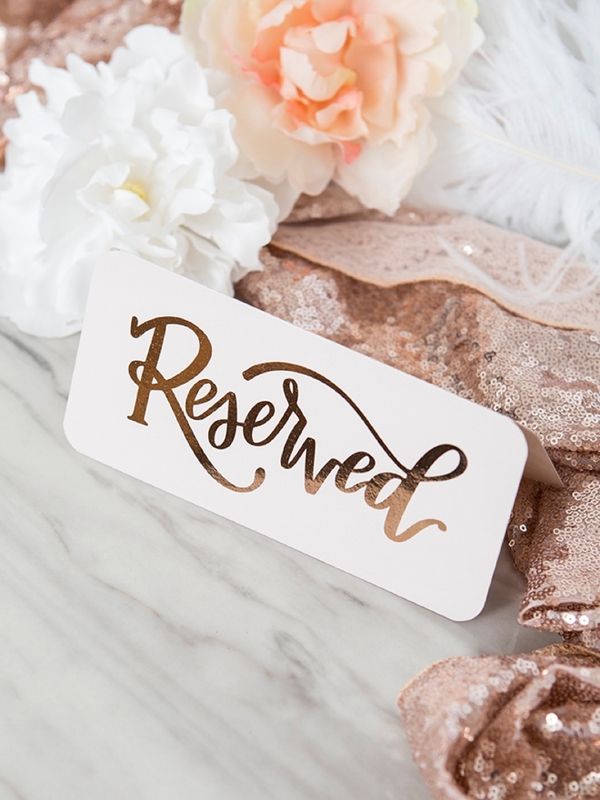 Black designs are perfect for printing on color or patterned paper and then adding metallic foil to, like the reserved sign below… and the full color files are simple print and cut designs that will make celebratory decor quick and easy. Some of our printable files are editable, so you can add names, details, and more to our exclusive designs! These are just a few examples of what you can make with our new designs! 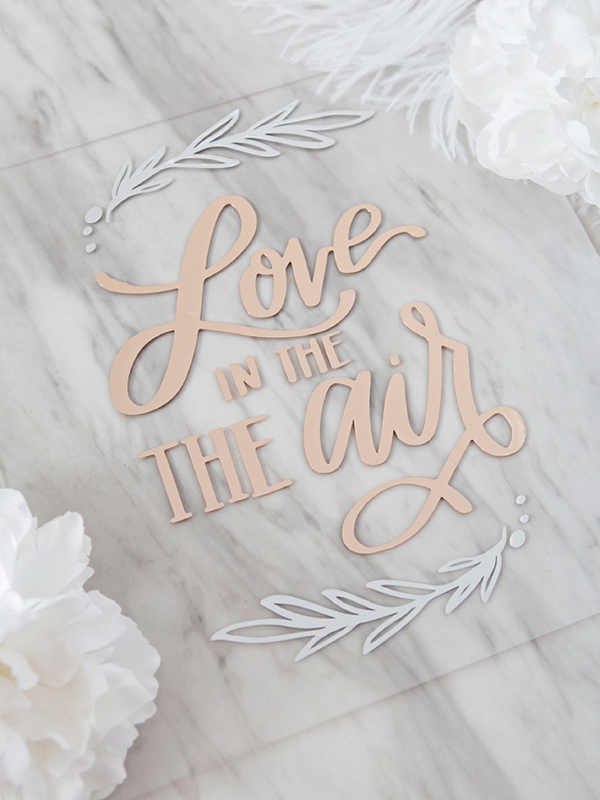 Love Is In The Air Acrylic Wedding Sign: using our love is in the air .SVG cut file and a clear acrylic plaque, I cut the design using my Cricut Explore and rose gold and silver vinyl. The perfect modern wedding sign! 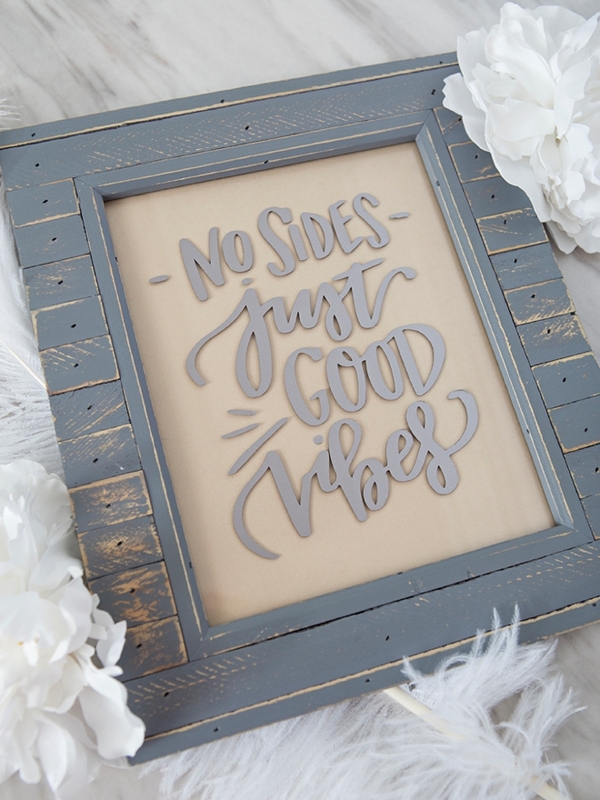 No Sides Just Good Vibes Wedding Sign: using our no sides just good vibes .SVG cut file and wooden frame, I cut the design using my Cricut Explore and stainless silver vinyl. I first framed a cream piece of cardstock and then applied the vinyl design to the front of the frame glass. I just love this saying! Printable Reserved Tent Table Card: using our reserved printable table tent card, I printed the design on pale pink cardstock using my laser printer, then I added “toner reactive” copper metallic foil to the card. Then I folded it in half and rounded the corners with a craft punch. This file comes with the printable tent card and also a .png of the design so you can make your own custom size sign with it! 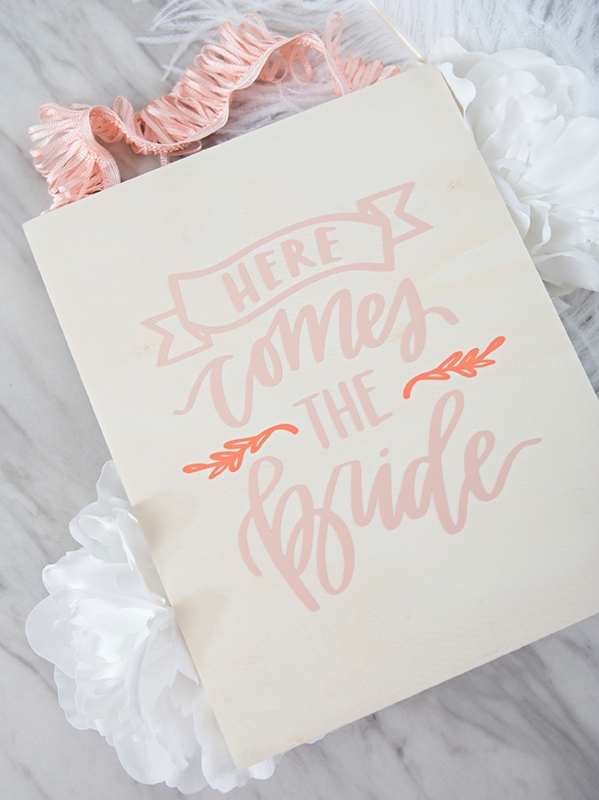 Here Comes The Bride Wedding Sign: using our here comes the bride .SVG cut file and a wood plaque, I cut the design using my Cricut Explore and premium pink and coral vinyl. Then I added a frilly ribbon to the top for a ring bearer or flower girl to carry down the aisle! 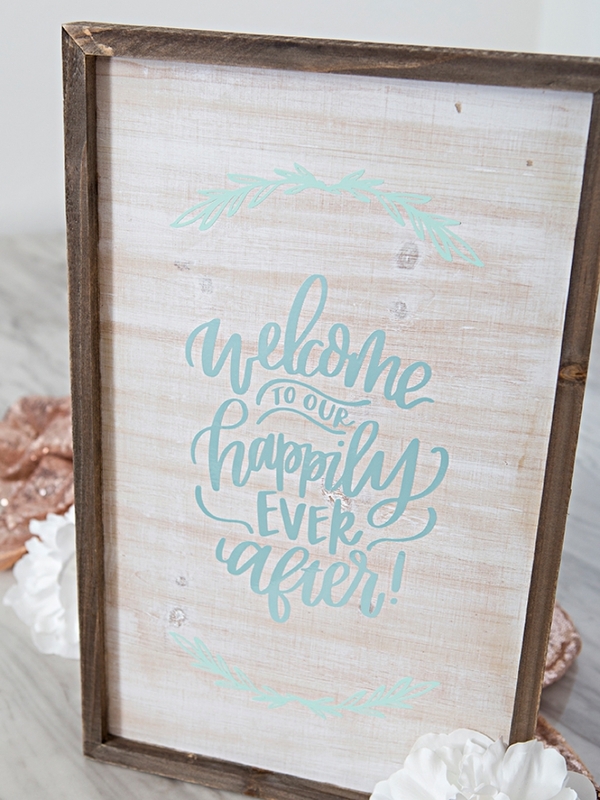 Welcome To Our Happily Ever After Wedding Sign: using our happily ever after .SVG cut file and a wooden plaque, I cut the design using my Cricut Explore and pearl blue and mint vinyl. The perfect rustic wedding sign! 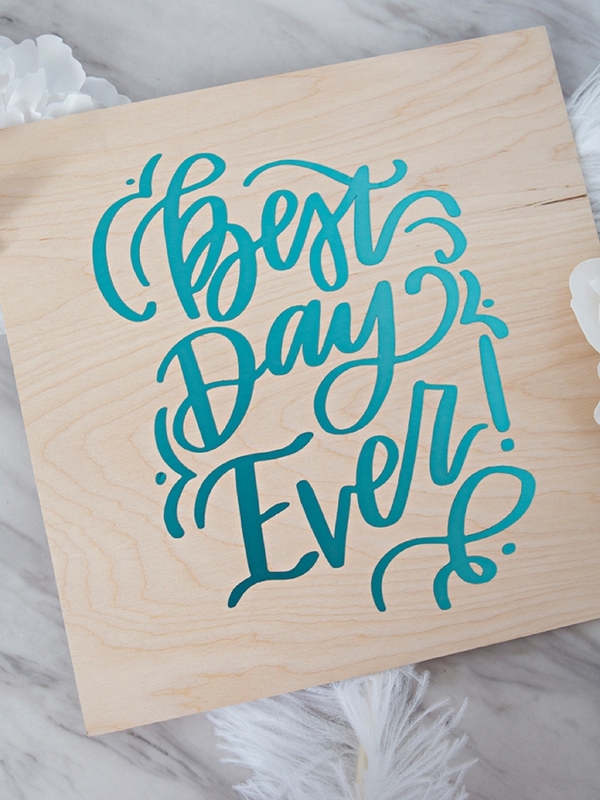 Best Day Ever Wedding Sign: using our best day ever .SVG cut file and a wooden plaque, I cut the design using my Cricut Explore and stainless teal vinyl. Making a super fun sign for any type of wedding! All SVG cut files are commercial use! Feel free to use them to create items to sell! All printable files are personal use ONLY. Images + graphics copyright SomethingTurquoise.com®.